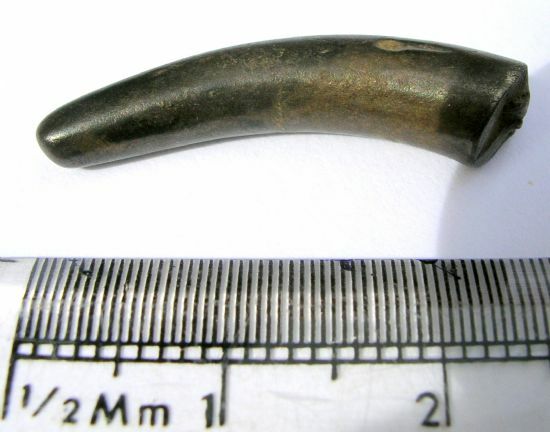 This small silver fragment from an arming was found at Dornoch. 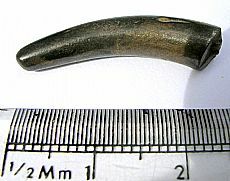 It is a piece of Viking ‘ring-money’. These simple, undecorated penannular armrings could serve two functions. When complete, they were a way to show one’s wealth. When silver was needed to purchase something, they could be cut up – along with any other silver – to be weighed for their bullion wealth. 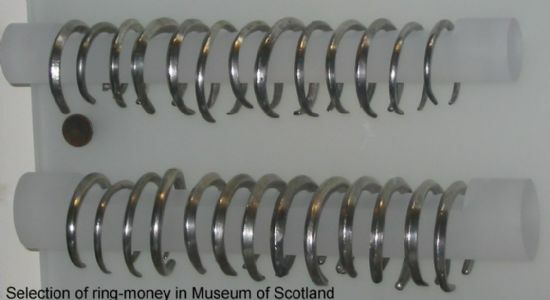 Ring-money is a distinctive type of armring probably made in Scotland. A number of silver hoards have been found containing such armrings and fragments, including the nearby one deposited in a wall at Tarbat church c. AD 1000 with 4 complete armrings and a number of coins, most from the Frankish empire, minted at the trading town of Quentovic. In the Viking period, silver of any form – coin, jewellery, ingots and even slag – was used for purchases, and the cut up pieces are termed hacksilver. Many of the objects and hacksilver have small nicks to check silver purity. They were weighed on balances, and several weights and balances are known from Viking pagan graves in Scotland. The weight standards are a matter of some debate. This find is one of a few from the area just north of the Dornoch Firth. An oval brooch, probably from a disturbed pagan grave was found as Ospisdale (see Find of the Month November 2010). Remains from other disturbed graves have been found near Dunrobin Castle. Together with nearby Norse placenames (such as Embo), they represent evidence of Viking presence in the 10th and early 11th centuries. Graham-Campbell, James 1995. The Viking-Age gold and silver of Scotland (AD850-1100). Graham-Campbell, James 1976-1977. ‘The Viking-age silver and gold hoards of Scandinavian character from Scotland,’ Proceedings of the Society of Antiquaries of Scotland 107, 114-35. Available on-line or at Inverness Reference Library. Picture of Dornoch ring-money fragment courtesy of Peter Wild, HistoryLinks Museum.